Well, I hate to say this, because I liked this book, but it’s a lie. Watsky completely deceived me. This didn’t show me how to ruin everything. 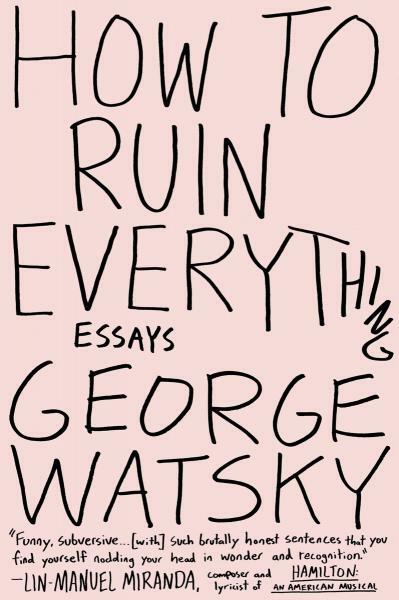 It did show me that George Watsky is a remarkable essayist. He is a humorist in pieces like Tusk, about smuggling a narwhal’s tusk into the U.S. from Canada (I don’t know why we’re building a wall along the Mexican border when there are over 5,000 miles of Canadian border that someone can just walk right through carrying a narwhal tusk! Sad! ), and the excellent Good Hook, in which he compares a fly-fishing trip to watching a middle-aged man try to join the Mile-High club with a pneumatically pulchritudinous seatmate who is not his wife. Watsky is profoundly personal, almost uncomfortably so, when he writes about his experiences with a seizure disorder in What Year Is It? and about his father’s connection to the San Francisco Giants in Crying & Baseball. And then, in essays like Three Stories, about the run-down house where he lived with oft-appalling roommates during college, and with Concert Tickets, about tripping on mushrooms, Watsky is me. Except he’s a better writer. Honestly, I don’t know how to feel about this book. It’s not perfect: there were some essays I really didn’t see the point of; which may have been the point, of course, but that still left me shrugging my shoulders and souring my mouth, thinking, “Well, what now?” When the same book has these great insights and fascinating stories, why exactly am I reading about Pauly Shore? But then, Watsky is not me: my ideas of what an essay should look like or be about are not his. But the writing is so very good, and the essays that did work for me worked so astonishingly well, that the ones that didn’t work for me generally had me questioning, not what was wrong with the essay or the author, but what was wrong with me. But I’m almost certainly overthinking it. I guess that’s how to ruin everything. It’s a fun book, with some ice-water revelations and eye-melting poignant moments, and really splendid writing, detailed and smooth and casually lyrical. I’m going to add Watsky to my list of essayists whose work I will always check for when I hit the bookstores. Since my list includes two men who are no longer in this world (David Rakoff and David Foster Wallace), I’m happy to get a new guy into the rotation.